Massimo Bottura has come a long way since the days of the Osteria del Campazzo in Nonantola, near Modena. His climb to stardom has been nothing less than phenomenal, and having apprenticed under the guidance of Georges Cogny, Alain Ducasse and Ferran Adria certainly didn’t hurt. The first Michelin star smiled upon him in 2002, the second arrived in 2006, and since 2012, three well- deserved stars shine brightly in his personal food galaxy. And let’s not forget the current No. 3 spot in the widely followed “The World’s 50 Best Restaurants List” compiled by Nestlé. So it is always with great pleasure that I stop for lunch or dinner at Osteria Francescana (such a great pleasure in fact that this time I invited two good friends to tag along), one of the true temples of fine food in Italy. However, the fabulous, precisely cooked food is not the only reason to swing by: star sommelier Beppe Palmieri is reason enough all by himself, as he’s one of the true wizards at matching food and wine in novel, inventive ways. Actually, on this dreary December day in Italy’s Emilia-Romagna region, I was more than happy just to come in from the cold, but I was quickly warmed up by the great wines and food that followed. I can’t think of too many better ways to start a meal than with a Riesling, and just about anything from Austria’s star producer Emmerich Knoll is as great a place to start as any. Knoll’s 2007 Ried Kellerberg Dursteiner Smaragd Riesling is drinking beautifully, offering exotically ripe aromas and flavors of mandarin orange, ripe peach and cardamom. It’s a rather Rubenesque beauty, concentrated and full-bodied, but with enough lively acidity to keep it in balance. Its finishing notes of smoky minerals match well with the complex Parmigiano dish and it has enough sweetness to stand up to the “almost too much of a good thing” foie gras dish (if you’ve never seen or eaten a foie gras popsicle look-alike, this is the place!). Though this Riesling is likely to be long-lived, Knoll’s Kellerberg Smaragd always strikes me as approachable earlier than its Schütt stablemate, and especially so in 2007. I move on happy to the next two standout meat dishes, secretly worried that my cardiologist may find out about my foie gras weakness. Up next is the single greatest dish of the day—in fact, one of the best of the year: the tortellini, so good that I seriously considered dumping my fork and asking for a funnel! Seriously, I could have had this dish as the antipasto, the primo and the secondo! Vincent Dauvissat’s fabulous 2009 Chablis La Forest, large-scaled but lively enough to cut through the opulent texture of the tortellini, proved a perfect foil for this rich dish. While it’s still young, I find that this particular vintage offers plenty of early appeal and is drinking quite well now; I doubt I’ll hold on to the bottles resting in my cellar for more than another eight or ten years. 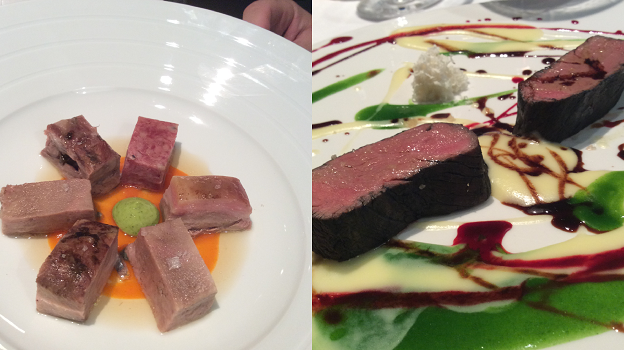 The “Bollito not boiled” is one of Bottura’s classic dishes (seven different cuts of beef slowly cooked—for 36 hours—at a lower-than-usual temperature), while the “Beautiful, psychedelic…” veal creation is a far more modern Pollock-esque take on meat, but both match splendidly with Chave’s heavenly 1997 Hermitage Rouge. I’m not much for extremely rich, almost fat reds (and ’97 pushed the envelope) but this wine has aged magnificently and comes across as plush yet graceful, a neat trick. Stylishly supple and glyceral, it overpowers neither the veal nor the bollito. I finished up with the Vignola, a cherry and chocolate dessert, and chose not to have yet another wine to finish off this memorable meal. 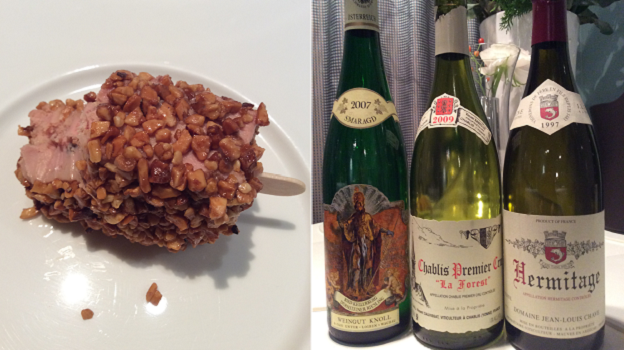 You can understand that, given the great wines and food, my day really couldn’t have been any sweeter.